Sometimes it is difficult to get a picture in your minds eye of what is being discussed and ruled upon. Hopefully this site will help you visualize rules and/or etiquette violations that you may encounter during a golf outing or tournament. The discussions here will be derived from the USGA Rules of Golf. I'm sure if you haven't found yourself in an area of "ground under repair" you will if you continue to play golf. 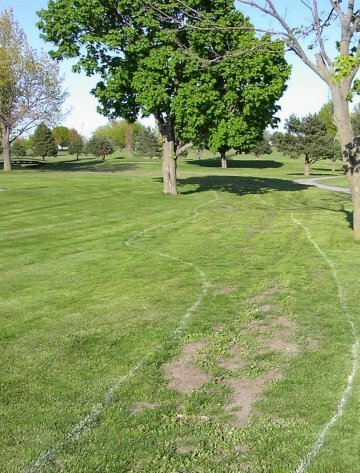 Areas designated as "ground under repair" are marked by the course professional prior to a tournament or event with white paint. 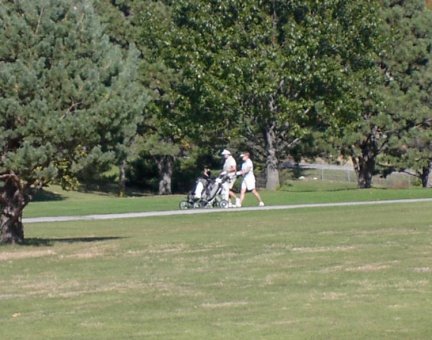 An example of such an area is shown here at Holmes Golf Course. Clearly the grass is missing and the area is bare dirt and has been designated as "ground under repair". OK, now that we know what to look for. How do we handle the issue if we find ourselves there in the future. Well, here I am with just such a problem. My ball has come to rest within a "ground under repair" marked area. I have a few options but a few issues need to be addressed. First, I must take FULL relief from the area. What do we mean by FULL relief? Not only does the ball need to be removed from the area with a drop but when I take my stance after the drop, no part of my body (feet in particular) can be touching the area. This is one area where we do not have the option to play it even if we want to. We MUST take a drop. Here I have taken my drop and the ball lies outside the "ground under repair". But I'm still in violation of the rule because my stance when preparing to hit the ball still has my feet clearly inside the marked area. Because I have not taken FULL relief from the marked area, I'll need to redrop the ball further from the area but no closer to the hole. After making a second drop, I can now take my normal stance to hit the ball without encroaching on the "ground under repair". Play can now continue and hopefully I will manage to stay away from more trouble. But if I find myself here again....I will know how to handle it. Knowing the Rules of Golf will only help you appreciate the complete game of golf. 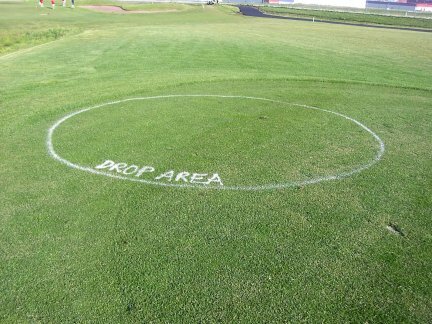 The drop zone is a marked area which can be found on par 3s and sometimes is found near water hazards. A drop zone is used if a ball is hit into water or an area where it can not be retrieved. This drop zone was marked on Highlands #12 a par 3 with a water hazard just off to the left of the green. If after teeing off the players ball manages to fall in the water the player must take a stroke penalty and redrop in the marked area. 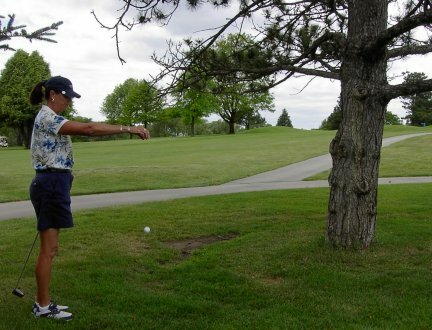 Unless otherwise stated the player could also choose to retee and hit from the tee box. But when hitting their second ball the player is hitting their 3rd shot. a) Grounding your club in a trap is a no no. Doing so will be a two stroke penalty in Stroke Play. 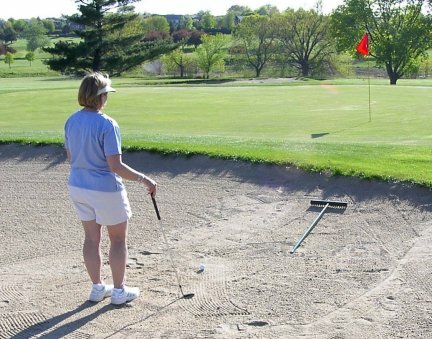 You are not permitted to touch the sand with your club prior to making contact with your down swing towards the ball. So take care. When we get ready to tee off on a hole it is important to know that you have more room than you might think. 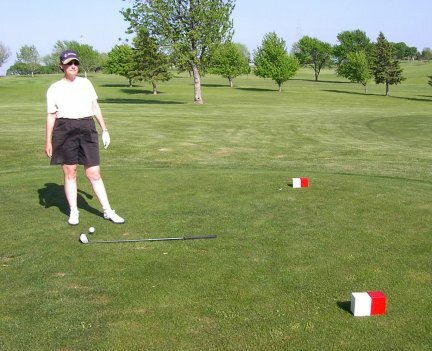 First and foremost it should be remembered that you MUST tee up your ball behind the designated tee markers, and not as we see here. 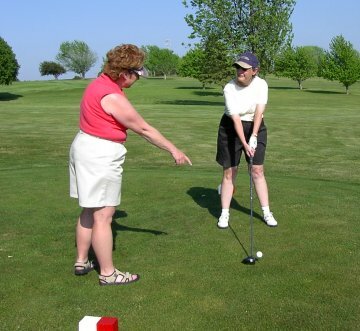 Cheryl informs Karen that she has mistakenly teed up in front of the markers and needs to move behind so as not to encure a penalty. 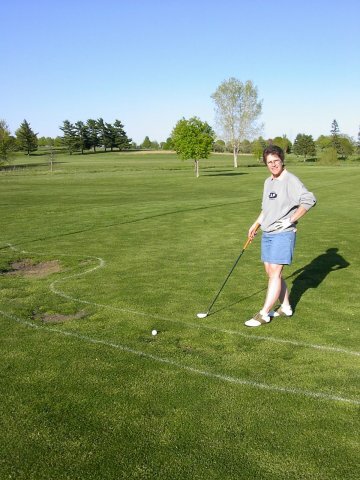 Karen has up to 2 club lengths behind the markers to tee up her ball and has illustrated that here. In addition, a player's ball is required to be placed between markers BUT the player is allowed to stand outside the markers to hit the shot. I'm sure, at one time or another, we have all found ourselves in a situation where we could not make a shot. Here we find Deb evaluating the possibilities for her next shot. 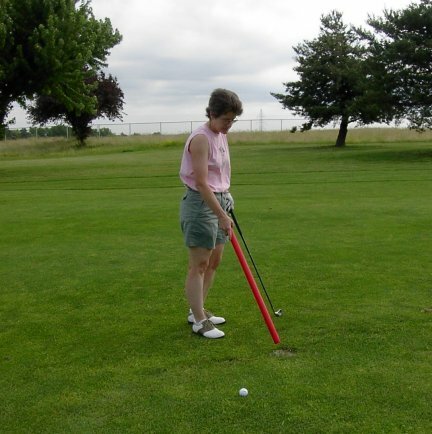 2) she can take two club lengths from the position of the ball and place a tee. Then she can make her drop and continue play. Below we see the correct way to drop a ball. Hold the ball out at 90 degrees from your body and let it drop. The ball should hit within the two club lengths you measured and marked with a tee. Deb can now continue play hitting her 3rd shot. How do you score this process? Tee shot landed at the base of the tree......stroke 1. Declare the ball unplayable, take one stroke penalty, and make your drop.....stroke 2. You are now ready to continue play and are hitting your 3rd shot. 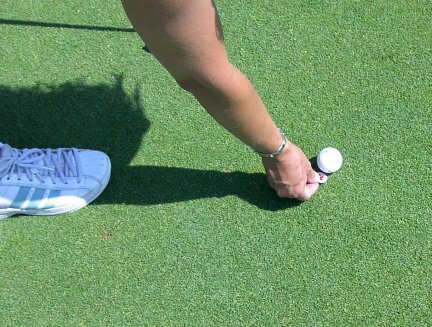 Have you ever come upon your shot in the fairway and found one of the distance markers so close to your ball that you can not take proper stance for the next shot? 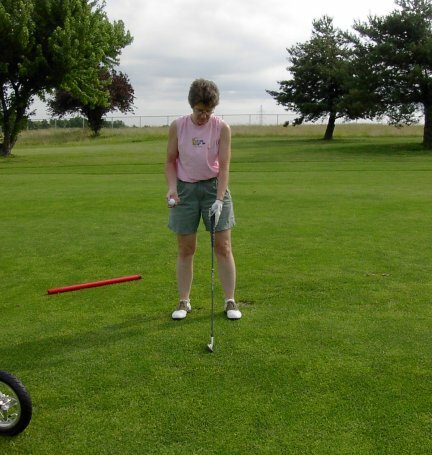 Here was just a case when the 100 yard stake kept me from taking a normal stance for my shot. The Rules of Golf allow for such an occasion. This is considered an obstruction and you have the right to remove the stake and lay it out of the way. But in my case, the stake had been placed in a concrete block that was right where my foot would be when setting up for the shot to the green. In this case, I am allowed to take further relief from the continued obstruction. 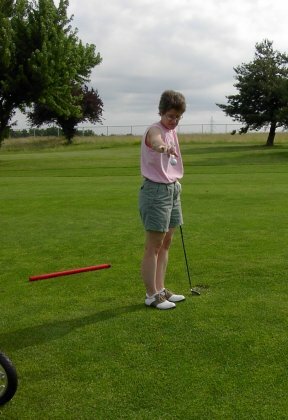 Mark your ball with a tee and lift the ball. Take your stance at a point that will give you complete relief from the concrete block but is no nearer the hole. Once this point is determined you have one club length to drop the ball. Your ball is now back in play and no penalty strokes are incurred. It pays to know the rules, because as in this case, I was benefited by knowing the rules of golf. Be sure to replace the red marker when you have completed your shot. Here is a lovely scene that can be found on any number of golf courses in the area. But if your like me, it also brings to mind....yellow or red hazard. What is the difference? Do I have the same options for both? Just the fact there are two kinds of water hazard, yellow and red, should tell you that there are some differences with our options when we find ourselves in one or the other. 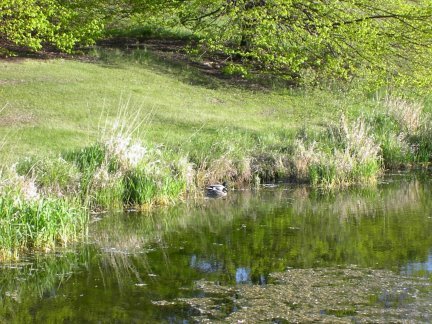 Water hazards are usually marked by yellow or red stakes depending on which they may be. If no stakes are present then look for a painted yellow or red line just outside the hazard area. 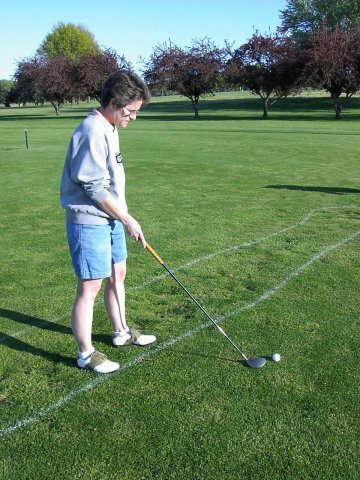 This line is considered IN the hazard so if your ball is touching or lying on the line, YOU ARE IN THE HAZARD. What now. First determine which hazard you are in. Water hazards, other than lateral water hazards, are defined by yellow stakes. Lateral water hazards are defined by red stakes. It can be confusing at times to know under which hazard condition you are in but keep a cool head and know your options. 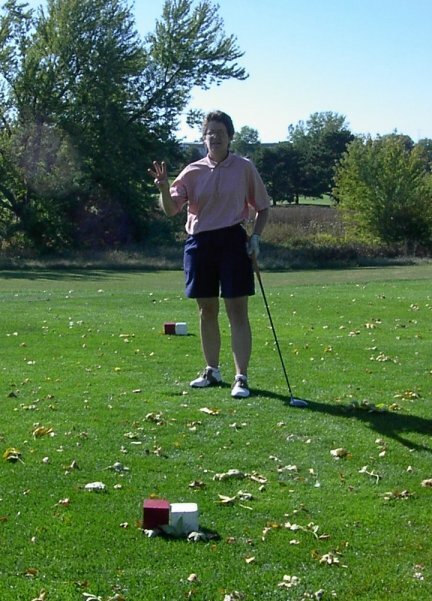 Below we see an unfortunate player who has determined that her ball has reached the water hazard. From the yellow stakes she knows she is under the condition of water hazard and has three options from which to pick for her drop. 2) If the ball is not playable, then imagine a line from the hole through the point where the ball last crossed the margin of the hazard. Under penalty of one stroke, she can go back as far as she would want and drop. 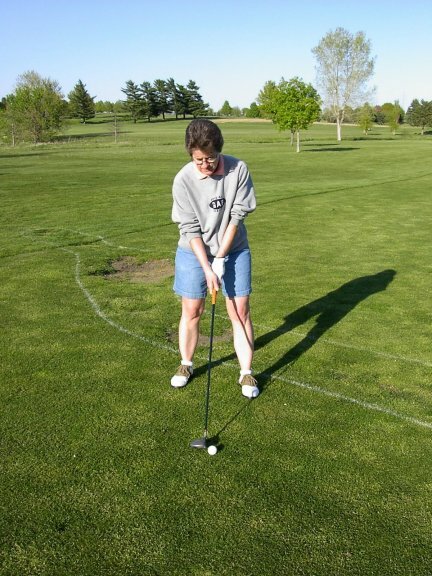 3) Or she can always take loss of stroke and distance or in effect, go back to the spot where the original ball was struck and play her next shot. How do you count the strokes? If her original ball was a tee shot that entered the water, then her next shot would be her third if she selected option 2 or 3. She would be hitting 2 if she was able to play out of the hazard itself. So what are our options from a Lateral Water Hazard? 5) we can hit from the opposite side of the hazard, where the reference point is the same distance from the hole as the point at which the ball originally entered the hazard, drop within two club lengths no nearer the hole. To keep play moving, the first person to hole out on a green should move to the flag and man it while the rest of the group finishes putting out. This is commonly done as a courtesy to the rest of the group. If however your group is falling behind, the first two players to hole out on a hole should move to the next hole and tee off while the remaining two players hole out . This will help your group get back into good contact with the group in front. One of the simplest rules of golf is one that seems to be hardest for some players to grasp. 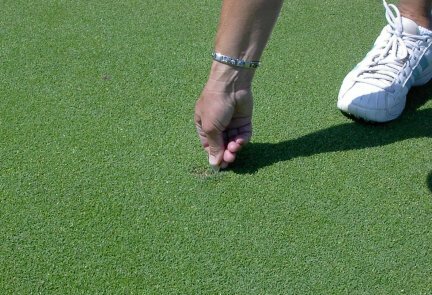 The act of marking your ball once you reach the green surface. , Basically we as players are not allowed to touch our ball before it reaches the green under normal circumstances. Of course we can all think of exceptions but for now lets just concentrate on the simple act. 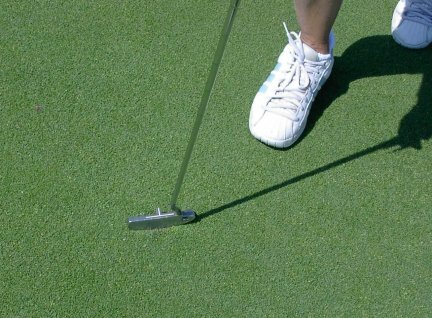 Once the ball has come to rest on the green, you must place a marker behind the ball when it has finally come to rest on the green. But do not touch the ball until you have placed your mark behind the ball. Then and only then can you lift your ball. 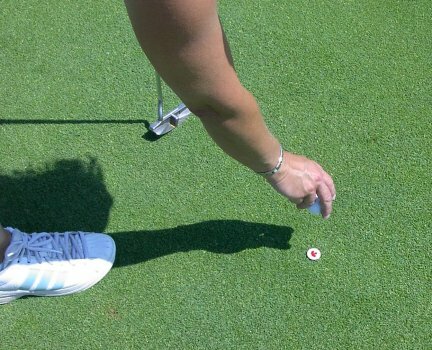 A ball marker can be a number of things, for example a ball marker, coin, tee, or anything else that will not move but still mark your position. Below is an example of the placement of a marker behind the ball. Here we see the player placing their marker behind the ball BEFORE they have lifted the ball. Once it is in place the player can legally lift and clean their ball. Have you ever walked onto a green and seen all the ball divot marks and muttered "why can't people repair their marks so the rest of us can have a clean putting surface"? Well, I know I have and I bet you have too. So for those new to the game, here is a simplified description of the act of repairing your ball marks after they have landed on the green surface. If you have hit a nice shot into a green the likelihood of the ball leaving a mark is good. So do the rest of the golfing public the courtesy of repairing your mark. A divot repair tool can be purchased from any course for a couple dollars. It looks like a little tuning fork. 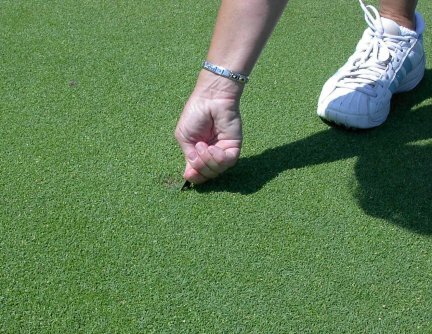 Once you have located your divot, insert the tool about 1/4" outside the divot hole and lift towards the center. Repeat this a few times moving around the divot. You will notice that the hole slowly is closed off by the slight movement of the turf. 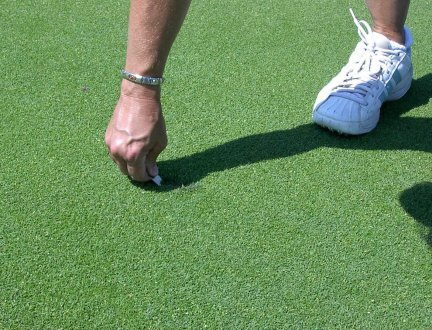 Then tap the raised grass with your putter to smooth the area. This allows the green to heal much faster, and will provide a smooth surface for all those golfers following you. And from me to you.....THANK YOU!! I feel that several of us hate to admit there have been times when we miss the fairway.....right? And, a few more times when we REALLY miss the fairway. So how do we handle the possibility of not being able to locate a ball. And, what if we DON'T want to find the original ball? Are these all viable options for us to consider? Well, believe it or not yes and hopefully I can explain the process we must consider when dealing with these situations and what rules are being invoked to make sure we log the correct score on the scorecard and avoid disqualification for signing an incorrect scorecard. OK, this is COMPLETELY hypothetical.....no.....really......it is.....ha ha. I arrive on the tee box at #11 at Holmes and hit a "lovely" duck hook into the tall fescue grass growing just off the second cut of rough. First, since the grass is taller than I and the likelihood of my getting out of this "lovely fall grass" (right....what have I been smoking huh) let alone finding the ball is in question. So, to save time, declare to your playing partners that you will hit a provisional ball from the tee box before going to hunt for your original ball. This declaration must be made to your partners prior to the search. If you fail to inform your playing partners then the provisional ball becomes the "ball in play" under penalty of stroke and distance. The original ball is deemed to be lost. Therefore, after you inform your partners of the "provisional" ball, you can then hit the second ball. At this point the provisional ball is only there in case we are not able to locate the original ball or declare it unplayable. So our first chore is to move to where the ball entered the fescue and try and locate the original ball. If the provisional ball lies short of the original ball and it is necessary for you to hit it a second time before reaching the original ball for the search, then do so under no penalty. However, do not hit the provisional ball if it lies at or ahead of where the original ball was lost, before the search for the original ball. This would immediately make the original ball deemed lost and you must continue play with the provisional ball under penalty of one stroke and loss of distance. So, after getting in there and letting myself know how displeased I was with myself for putting my ball in such an unfriendly place, I started thinking, what are my options. First, I have not been able to locate the ball yet. 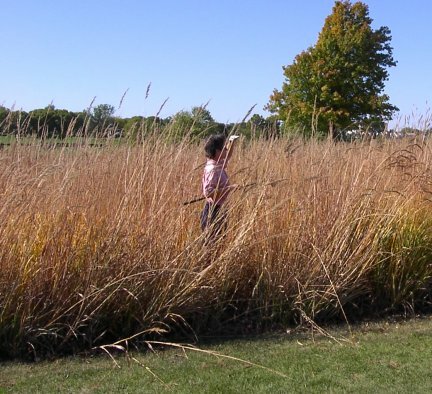 Plus I can not even imagine hitting the ball from this tall grass. So lets use the rules to our advantage. I can tell my playing partners, who are likely helping me to find my ball, that I am suspending the search and that I declare the ball lost. At that point, everyone should discontinue the search. Because if someone does locate it then it IS still considered the live ball and I am REQUIRED to play that ball. The provisional ball at this point must be picked up and you MUST play the fescue ball. Second, lets say you find the ball and do not want to play from this unfriendly area. You must now declare your ball "Unplayable" and the rules for unplayable balls are invoked. a) play the next shot as near as possible to the spot the original ball was struck. In our case, I would have to return to the tee box and rehit the tee shot and be hitting my third shot. Or since I have already hit a provisional, I can declare that to be my live ball and take the stroke and distance penalty at that point. b) drop a ball within two club-lengths of the spot where I found the ball, but no closer to the hole. This means that if I'm deep enough in the fescue and two club-lengths do not get me out then I would have to keep dropping and adding strokes until I get out. May not be a great option in that case.....some of these fescue patches are very wide. So think these situation through. c) drop a ball behind the point where the ball lies, keeping that point directly between the hole and the spot on which the ball is dropped. Basically if you drew a straight line from the flag through the ball in the fescue and back behind, then anywhere along that line behind the spot in the fescue is fair ground to make your drop. There is no limit to how far back you go as long as the spot keeps the original position in the fescue between you and the pin. Once you have completed your drop, discuss it with your playing partner and make sure that you record the correct score for the hole. Errors at this point can be devastating if you end up signing an incorrect scorecard. The rules are a part of the game of golf and if you know your options, these rules can actually help you at times such as these. So know your options. 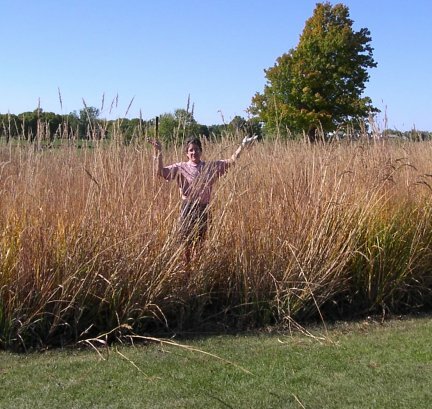 And I hope NO ONE ever finds themselves in these darn fescue grasses because you'll itch for the next few weeks. Ugh What we do for this great game!! !